Michelin North America is adding to its Tweel airless radial portfolio on its Turf and UTV lines. 13-inch ZTR caster design with improved performance and stability. 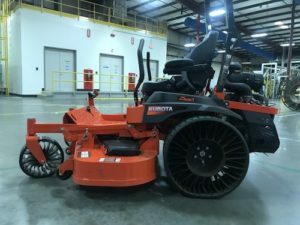 Gravely, Ferris, Kubota and Grasshopper operators of ZTR mowers using 24-inch, 5-4.5-inch bolt-pattern rear tire/wheels will be able to buy the Michelin X Tweel Turf airless products for their commercial mowers in limited quantities by the end of 2018. Grasshopper M1 MidMount 200, 300 and 400 Series and FrontMount 900 Series. Available immediately in the 13×6.5N6 size, the new configuration is designed to provide enhanced performance and more stability with its flat, smooth design, fitting a larger range of mowers than the current ribbed version. Two utility off-highway applications will make their debut: the 26-inch UTV 5-4.5-inch bolt-pattern hub for John Deere Gator UTVs and Argo XTVs and the 26-inch UTV 4-110-mm bolt-pattern for several Honda, Kubota, Yamaha and Argo ATVs and UTVs. The new Michelin X Tweel UTV 26x9N14 airless radial tire with 5-4.5-inch and 4-110-mm bolt-patterns designed for use on ATVs and UTVs will be sold as fitments for the John Deere, Honda, Kubota, Yamaha and Argo replacement market. With a 50-mph speed rating at a maximum gross vehicle weight of 2,860 pounds, the 26-inch UTV will be available in limited quantities by the end of 2018 for a variety of machines, including John Deere Gator XUVs, Honda Pioneer ATVs, Kubota RTV 900s, Yamaha Vikings and Argo XTVs and ATVs. “Our production facility is primed for increasing our portfolio and has been manufacturing these new products for customers to boost their productivity and bottom line,” Brauen said.